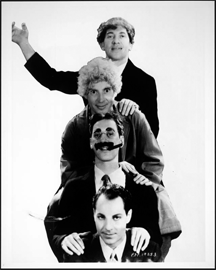 The Marx brothers (Chico, Harpo, Groucho and Zeppo), early in their career. Comedy teams — make that successful comedy teams — display all of the features of high performance teams. Their performance requires dedicated commitment, a high sense of trust and strong interpersonal relationships. For instance, in live performance, things rarely go exactly as planned. It's up to the team members to adapt as they go, in response to the odd things that happen. Courtesy U.S. Library of Congress. Most organizations execute their work in groups they call teams. When they really are teams, they're very effective. An increasingly common structure is the "virtual team," which usually consists of people from different organizations, or people who reside at different geographical sites, or both. Both of the qualities of being virtual and being distributed tend to make team formation more difficult, because they hinder the development of warm, trusting, personal relationships. Although virtual teammates do coordinate their efforts, the personal dimension of their collaboration is sometimes so limited that we cannot truly call them teams. Sometimes, they know each other only through email, text, or telephone, and the telephone calls are often at odd hours. They are teams in name only — TINOs. That's fine, but problems arise when we try to manage TINOs as if they were teams. If we expect members of TINOs to identify with the group, and if we expect team management techniques to work when we aren't actually dealing with teams, we're headed for trouble. In a future article, we'll discuss management techniques for TINOs. But let's begin by examining the attributes of TINOs. The defining feature of a team is that its people work together so closely that they can anticipate each other's strides and stumbles. When needed, they step in to support each other, and their support is welcome. In TINOs, when almost everyone is working on multiple teams, it's hard to focus on teammates or what they might need. Although a TINO's people sometimes make commitments, their "honoring rate" can be low. It's not that they don't care — they're usually just overcommitted, or they don't really feel allegiance to the TINO. This leads to a low level of trust, which they replace with "monitoring." That is, they spend significant effort reporting to each other and to "those responsible" about how things are going. Trust is much cheaper than monitoring, but it's impossibly unreliable when people are so overcommitted. In TINOs, many relationships between pairs of team members are weak, and limited to the task at hand. In fact, some pairs have never even met. To each other, many are just voices on the phone — they've never seen photos of each other, and never visit each other's offices. When the project gets into trouble, and they convene an Emergency Project Review, some team members meet for the very first time, even though they've been "working together" for months (or longer!). For more about Trust, see "Creating Trust," Point Lookout for January 21, 2009, "The High Cost of Low Trust: I," Point Lookout for April 19, 2006, and "Express Your Appreciation and Trust," Point Lookout for January 16, 2002. Would you like to see your comments posted here? rbrenrJdFhPdSRqRdWBEmner@ChacYLlLOgTkWQvLMNCloCanyon.comSend me your comments by email, or by Web form. I offer email and telephone coaching at both corporate and individual rates. Contact Rick for details at rbrenzUQwkmaHBhXJKfIWner@ChacusZtZXGevThnjasGoCanyon.com or (650) 787-6475, or toll-free in the continental US at (866) 378-5470.